If you need to find a way to integrate your favorite fast food into every big holiday, I've found some fast food related Halloween costume ideas for you to consider. First of all, for your kids there's a Ronald McDonald costume from halloweencostumes4kids.com. I wonder how McDonald's feels about somebody selling a Ronald costume and using their trademarked clown? Sure, it's free advertising, but you never know what somebody is going to do with one of these costumes. I can just see a little person robbing a bank in this costume! That would be a front page story for sure! Then there's this cheeseburger hat costume for adults. Now THAT is scary! And not in a good way! Wow. It is available from lambstore.com. They also have a might spiffy looking hot dog hat, too. Or you could go straight to the fast food source and buy a mask from Burger King. 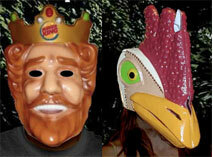 BK is selling a 'king mask' and a 'subservient chicken' mask at bkmask.com. They are each $10 and only come in adult sizes. Another easy costume would be to dress as a fast food worker. Get a nametag, make up a different name, something funny or with an edge. Also, make up the fast food chain you supposedly work for as well as a slogan. Buy a polo shirt, blacks pants, shiny shoes, a vest and you will be on your way. The key to this costume is the type of attitude you will decide to adopt. Are you going to be the earnest, or clueless, or retired person who works at a fast food restaurant to give them something to do, fast food worker? And I couldn't resist posting this photo of a fast food DIY costume idea for your pets! Be sure and post your fast food Halloween ideas in the comments below and have a great Halloween next week! I am just going to wear my fast food uniform and go as a history graduate. Not much of a stretch, but the reactions will be nice.